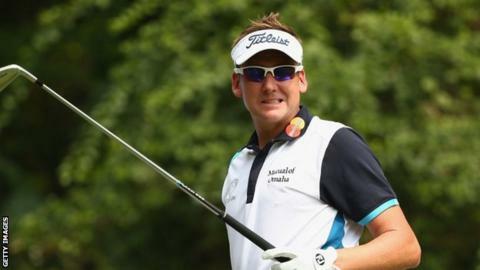 Ian Poulter shrugged off the effects of his late dash from Florida to record three-under par 67 in the first round of the Hong Kong Open in Fanling. The 39-year-old Englishman is trying to save his European Tour card and chance of Ryder Cup qualification after dropping to 51st in the world. American Rich Beem gave up his tournament invite to help Poulter out. Italy's Andrea Pavan and Lu Wei-chih of Taiwan share the lead on six under, one ahead of Justin Rose who is tied third. Poulter, who won this tournament in 2010, and had top-five finishes in 2009 and 2011, only arrived at the course at 19:00 local time on Wednesday, having set off from Orlando at 09:00 on Tuesday. He teed off at mid-day on Thursday and followed birdies on the second and fifth with bogeys on the eighth and ninth to reach the turn in level par, but came home in 33 thanks to birdies on the 10th, 15th and 17th. Poulter has played in nine European Tour events this season but dropping out of the world's top 50 on Sunday meant he would be ineligible for his planned appearance in the WGC-HSBC Champions event in Shanghai, thus leaving him unable to play in the 13 events required to retain his European Tour membership. Players must be members of the European Tour to be eligible for Ryder Cup selection. Lu came close to retirement three years ago after undergoing brain surgery when a non-malignant tumour was discovered in 2012. "For the first six months after the surgery, I had no power and I didn't think I could play golf anymore," the 36-year-old said after a round containing eight birdies and two bogeys. "I had to rest for another six months and when I did start playing a little bit, I could barely walk after 14 or 15 holes. "I just keep telling myself that I want to be a real golfer again and compete on the Tour."